Well I haven't spent any time down the allotment or doing much of anything really apart from sorting and working. Last week seemed to take forever to pass and I'm sure this one will take longer but whilst sorting through my files I found some photos which I had obviously taken to write some posts about but then never got around to it so I figured today I would share this rather random selection with you!! Kind of self explanatory really. 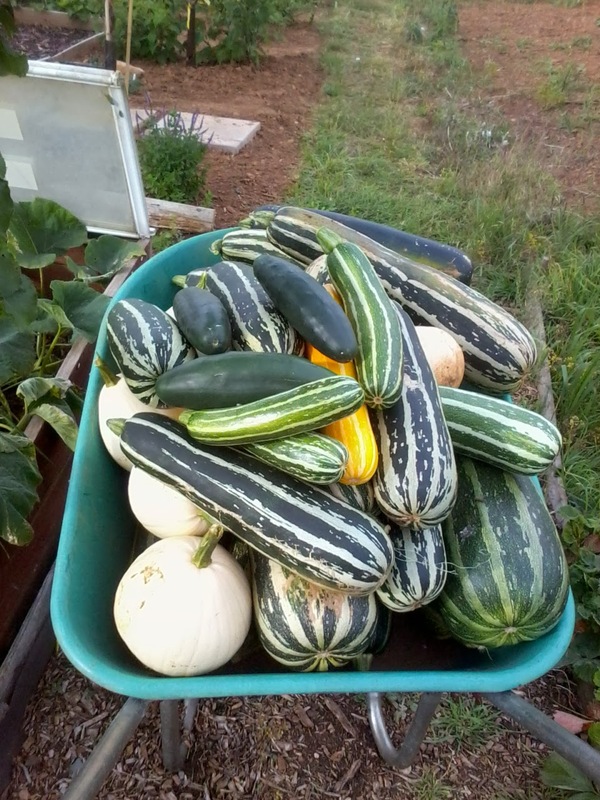 The squash did well!!! 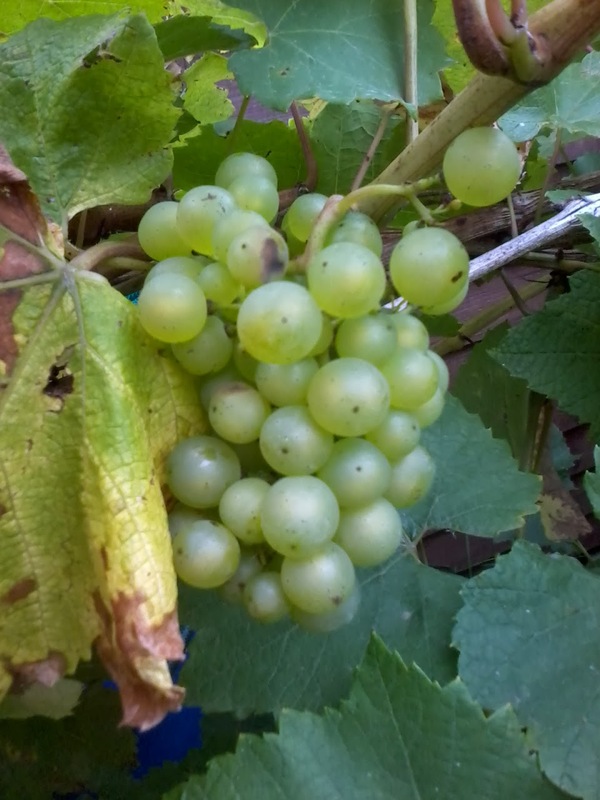 I never did get the grapes picked but I'm sure the birds will be grateful for them!! As always the raspberries did great!! This is supposed to be a Victoria plum tree but but it doesn't look much like one to me...any ideas on what fruit it could be?? 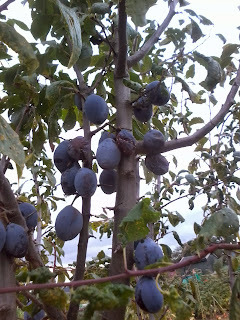 Maybe another plum variety or damsons I am thinking. 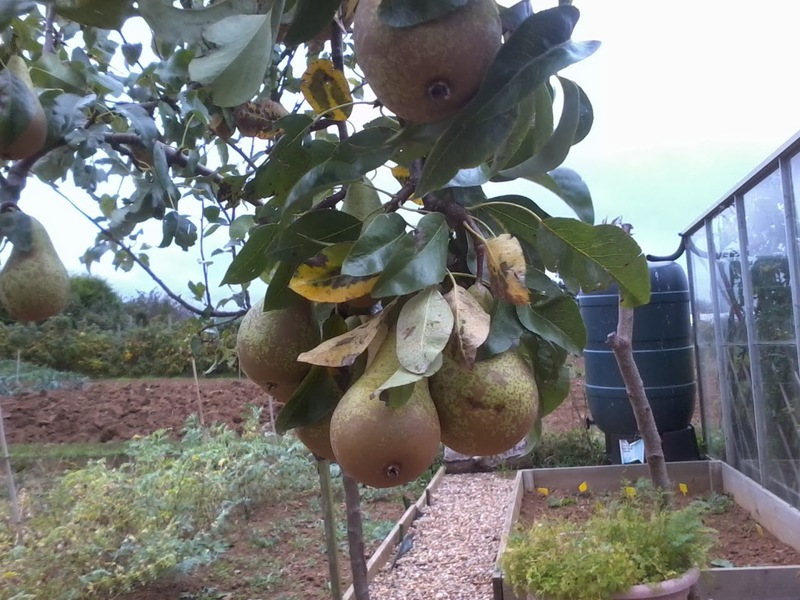 Conference pears a plenty this year....I currently have some pear vodka fermenting...yum!! 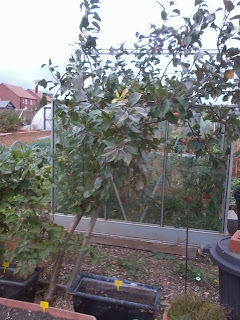 A rather random photo of the bramley apple tree. As you can see it really wants to lay down. 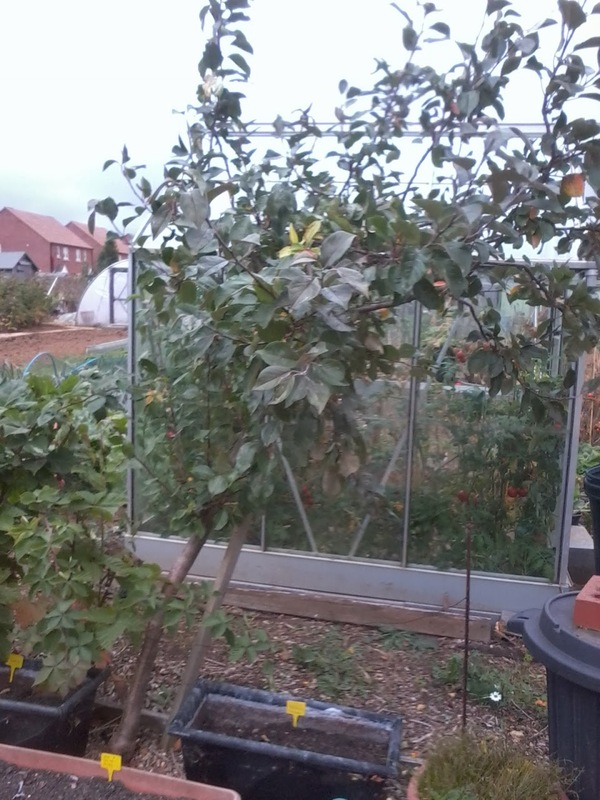 It had had a good prune now though and has been staked in an attempt to get it to stand up a little straighter...I'm not holding out much hope though!! 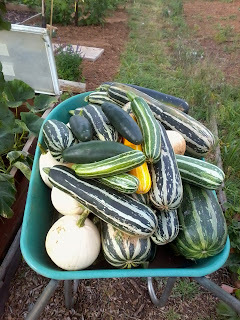 Pumpkins and spaghetti squash...did I ever tell you what I did with any of these?? 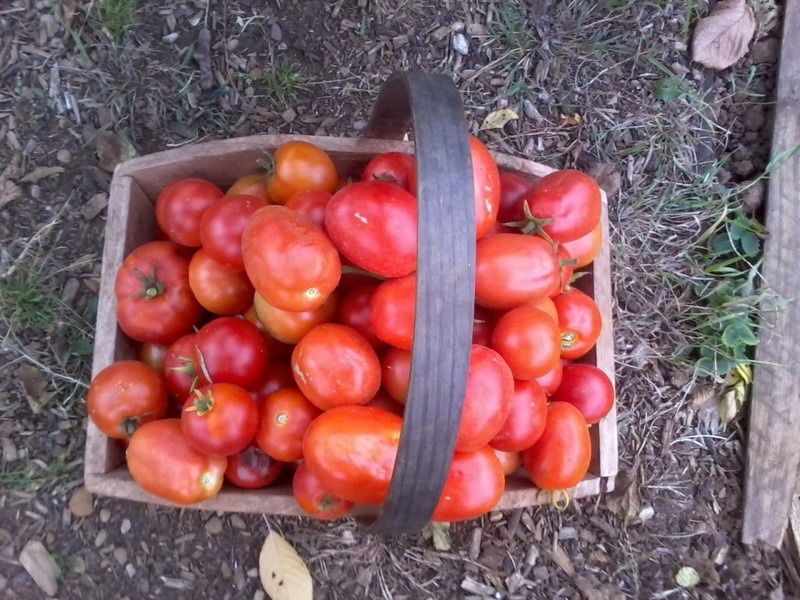 Finally the plum tomatoes. 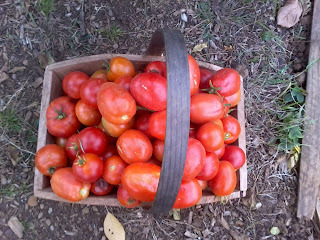 None of the tomatoes did really well this year so I was happy with these and made some nice tomato pasta sauce with them. 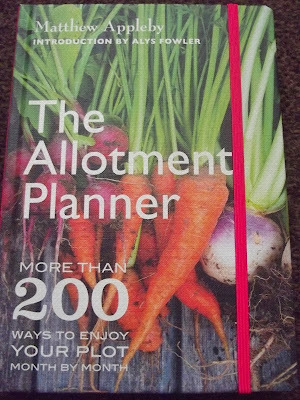 Well I promised you all a review on the allotment planner book that I won in the give-away which I mentioned here. So I read this book through and to be honest wasn't disappointed at all though to be honest most of the time it was more of an amusing idealistic read that anything that I could put into place. The book likes the phrase 'if rules allow'. Which is something to bare in mind if you do purchase it and what to try out the majority of the projects mentioned. Don't get me wrong, they are fantastic ideas and if I had a small holding of my own I would take on board each and every project in the book. 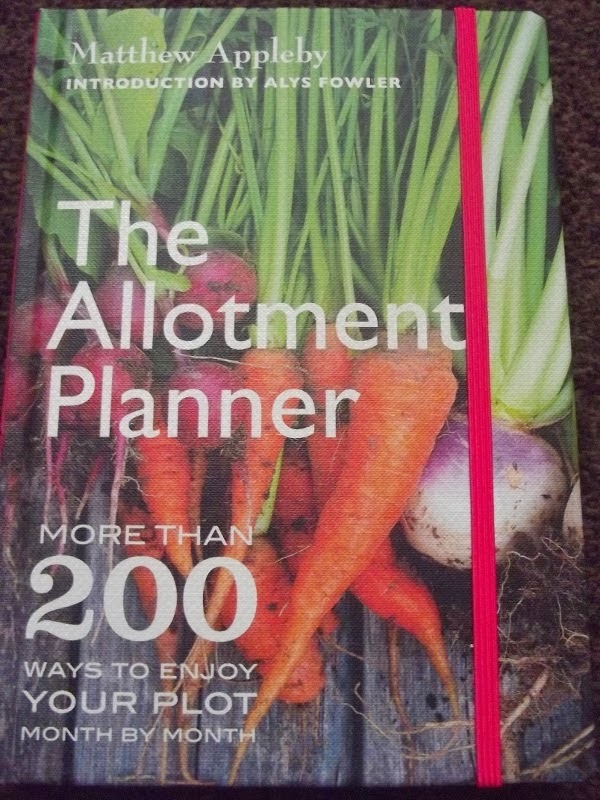 But it does refer to itself as an 'Allotment Planner' which in my personal opinion is where lies the problem. The majority of the book I could not do on my allotment because rules wouldn't allow and for good reasons which I wouldn't want to dispute. I think some of the projects though could be altered to make them suitable for allotment holde5rs but if the book is what the title suggests then you shouldn't have to tweak things in order to be able to use them. 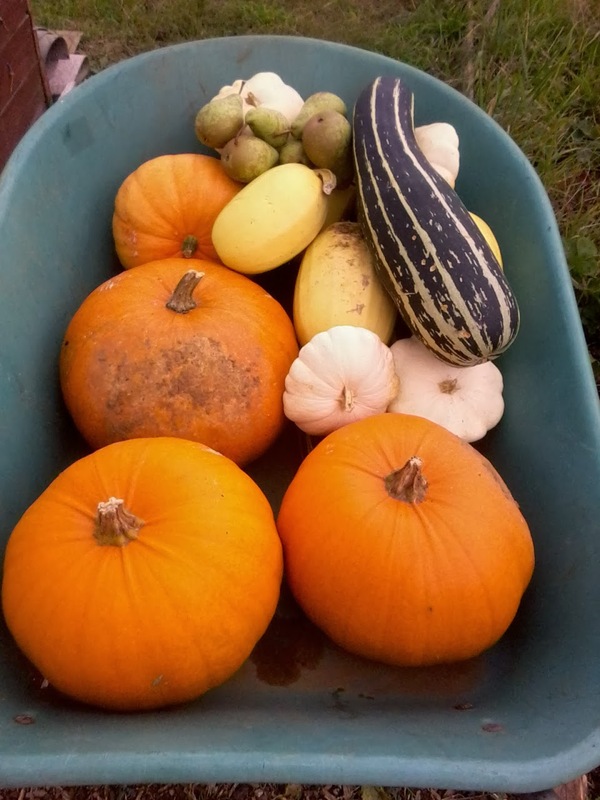 Anyway, in all a good read and certainly one that I can refer to for things and also some great ideas which with a bit of adaptation will be good for the bee plot but to be honest noting of huge value to the part of my allotment where I grow my veg. If I were still a total beginner with my allotment then I think I would gain a little more use from it. As stated on Jo and Sue's blogs 'The Book People' are selling it for just £4.99 so at that price I think it is quite a good buy but I would have been upset if I had paid r.r.p. of £14.99. Just to remind everyone it's all persona; opinion and the book won't be wasted as it has space in each month to jot notes which is always a handy thing!! Well I think that may really be an understatement. The weather on Thursday was fierce across the whole of the U.K. and much damage was caused by ferocious winds which then led to tidal surges and swollen seas causing rivers to burst their banks and flood. My heart goes out to all of those that suffered damage as they I write this post. I hope all my readers and anyone else is safe and people soon get back in their own homes if they cannot be in them right now. The strongest wind recorded last Thursday was 142 m.p.h. That's is kind of strong. We didn't suffer to badly in my area. We are to far inland for the tidal surges to affect us and I don't live near any rivers so we didn't have to worry about the water but the winds are always a worry and although I don't think we got the strongest gusts they were very fierce. Personally we didn't suffer any wind damage though next door did loose one of their fence panels. This is much to Trojan's delight who keeps being incredibly 'nosey' into their garden but it too much of a wimp to actually venture in as they have a cat...yep, Trojan is scared of the cat!! 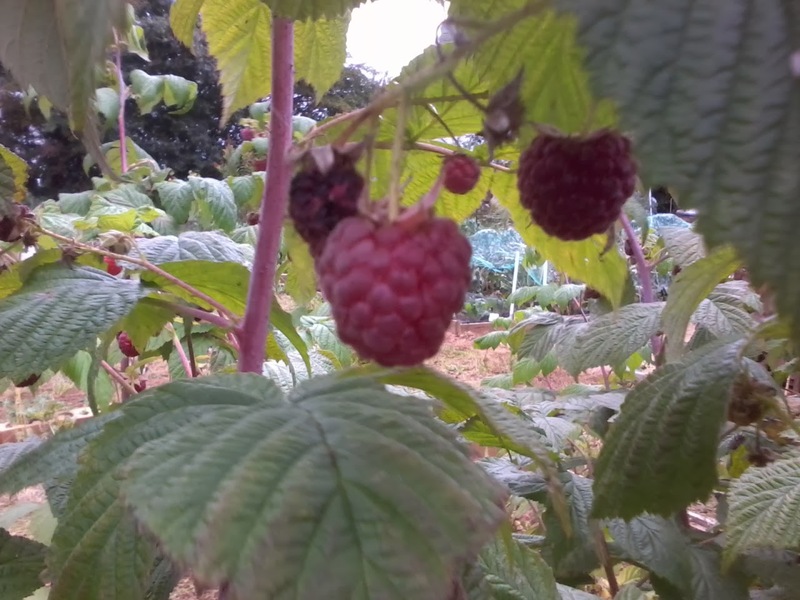 I popped up the allotment yesterday when I got that chance a little fearful about the greenhouse and the beehives but all was well when I checked. One pane of glass got chipped in a corner but apart from that everything else was OK. A quick ear to the hives told me that the bees were keeping themselves hidden and warm as I listened to the lovely buzzing. My allotment neighbour lost a pane of glass in his greenhouse so I gave him one of my spare and some new clips so he could get it sorted straight away. Well this was just a quickie really to say I hope all my readers are well after the recent weather. I will be posting some pic's for you tomorrow and even a reason behind the pics but for now stay warm and safe and enjoy the rest of your weekend!! Well I don't usually have much luck in raffles and give-aways and such so imagine my delight when I was announced a winner on a recent book review/give-away By Sue over at G.L.A. The book I received was actually reviewed on tow of the blogs I follow and I entered not only on Sue's blog but also on Jo's. They are both great blogs and if you aren't familiar with either of them then I encourage you to go over and take a look as they are both great blogs which are well written and fun to read. The two reviews that were given by Sue and Jo were very different which was what made me really enter for the book as I was certainly intrigued by there different views!! I haven't had a chance to look through it yet but when I do I think I will give you a little review of my own too...nothing wring with being through and getting plenty of opinions when looking for books either for yourself or for a gift. I will make sure I get the review up in the next week so that anyone looking for extra Christmas presents would have a chance to purchase the book if they wanted too!! Below I have linked to both Jo's and Sue's book reviews so you can go and see what they had to say about the book and also check out their blogs with ease. Nothing about the allotment today as I have been very lazy over it of late and a real wimp about the cold so I haven't done any work of late although I may go and do a bit today as the weather is quite mild and there is little wind so it would be a good opportunity to get a little more clearing done though I can't see me getting much if any digging done. But I digress from the reason for my post. I think I should just change my title to 'The Hedgehog Rescuer' Yes you guessed it, I found another hedgehog although I can't solely take the credit for this one as it was actually Trojan who found it in the street and nearly had a heart attack when it moved...bless him!! Anyway, I was concerned because of the time of year so scooped it up and got in touch with the R.S.P.C.A. According to them it was a little underweight and so they asked if I could keep it until they could come and pick it up...not a problem I said. I made him a lovely little home in the cat box with a towel and newspaper and gave him some cat food and water. All sorted...Did have a little issue with our cat Alfie who although will NEVER get in the box when he needs to visit the vets was adamant he was going to curl up with the hedgehog. After finely shutting him in the house securely I got the hedgehog settled in his little secure home where he would be safe until the R.S.P.C.A. could pick him up!! This is my cat carrier...nice and secure!! 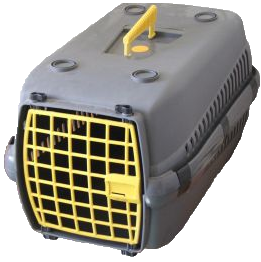 So above is a cat carrier identical to the one I have...all clasps were secured and a nice little safe and cosy home was made...or so I thought!!! This is where Houdini gets his name. The R.S.P.C.A. came this morning after giving me a ring to make sure it was convenient and turned up ready with their transportation box to take 'Houdini' to the wildlife hospital. We unfastened All the clasps and started moving the paper out the way...then we moved the food bowl...then we carefully moved the towel...and checked...and checked again...you guessed it...no hedgehog!! Now how he got out of the box we have no idea...the door wasn't chewed or anything and the box was sat on top of my chest freezer out the way of Alfie...the only thing we could do was search...and search we did in all the nooks and crannies and in the shoes and corners but found nothing. I had a little panic moment wondering if he could have got out the cat flap...we really weren't sure but then I thought of something else!!! The back of the chest freezer has an open cavity where all the elements are and sure enough that is where we found Houdini looking very smug and lively!! So we had to pull all of the freezer out and then lift it to get a hold of him but eventually got him into the box safely. Even now we still don't know how he managed it and the guy from the R.S.P.C.A. did say he hoped the cardboard carrier would hold him until they got to the wildlife hospital!! Of course with everything pulled out in the conservatory I figured I may as well scrub the floors..not really my plan for a Sunday morning but it will save me a job tomorrow!! So there you have my exciting Sunday morning...and all before 9am!!! It's 1st December today and lots of people are talking about decorating...we won't be doing that for a while...I wonder what Trojan will think to the tree?? I realise today how little I have posted this year but I am hoping to be more on top of things next year and get up to speed again with a little more regularity not just of writing my blog but keeping up to speed with what everyone else is doing too!! There are a couple more things for me to share with you this week though so expect me back soon. Well hope you all enjoy your Sunday! !